Today we will cover the Developer Studio basics and show you how to create your very first advisor where we will pick two status variables and give advice about their outcome. 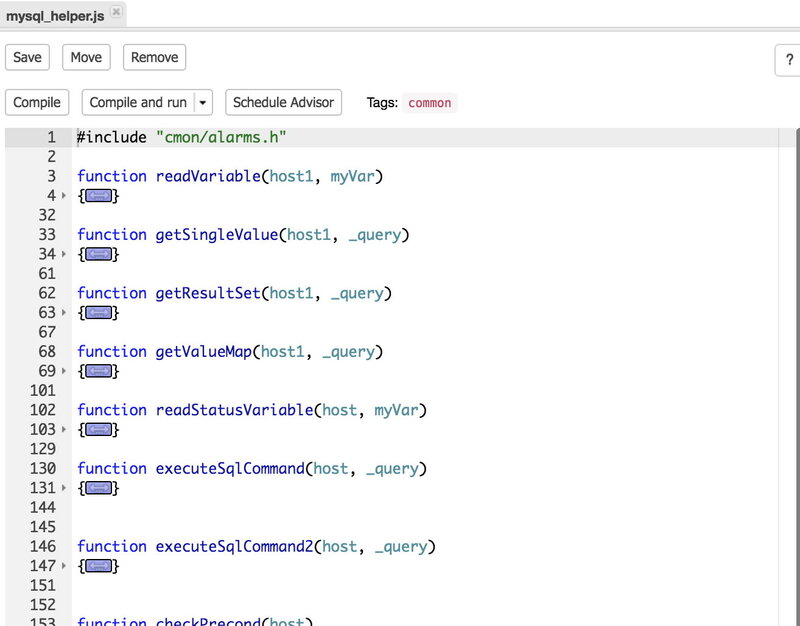 Advisors are mini scripts that are executed by ClusterControl, either on-demand or after a schedule. They can be anything from simple configuration advice, warning on thresholds or more complex rules for predictions or cluster-wide automation tasks based on the state of your servers or databases. In general, advisors perform more detailed analysis, and produce more comprehensive recommendations than alerts. The advisors are stored inside the ClusterControl database and you can add new or alter/modify existing advisors. 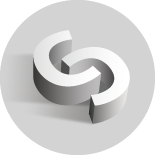 We also have an advisor Github repository where you can share your advisors with us and other ClusterControl users. Various numeric data types like integers and unsigned long long integers. Arrays are two dimensional and single dimensional arrays are lists. You can find the full list of differences in the ClusterControl DSL reference. You can also see the schedule of the advisor in crontab format and the date/time since the last update. Some advisors are scheduled to run only once a day so their advice may no longer reflect the reality, for instance if you already resolved the issue you were warned about. You can manually re-run the advisor by selecting the advisor and run it. Go to the “compile and run” section to read how to do this. The Import button will allow you to import a tarball with new advisors in them. The tarball has to be created relative to the main path of the advisors, so if you wish to upload a new version of the MySQL query cache size script (s9s/mysql/query_cache/qc_size.js) you will have to make the tarball starting from the s9s directory. Note: make sure the s9s directory is present in /home/myuser/. 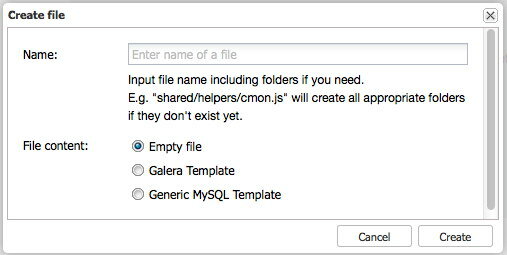 In this dialogue, you can create your new advisor with either an empty file or pre fill it with the Galera or MySQL specific template. Both templates will add the necessary includes (common/mysql_helper.js) and the basics to retrieve the Galera or MySQL nodes and loop over them. 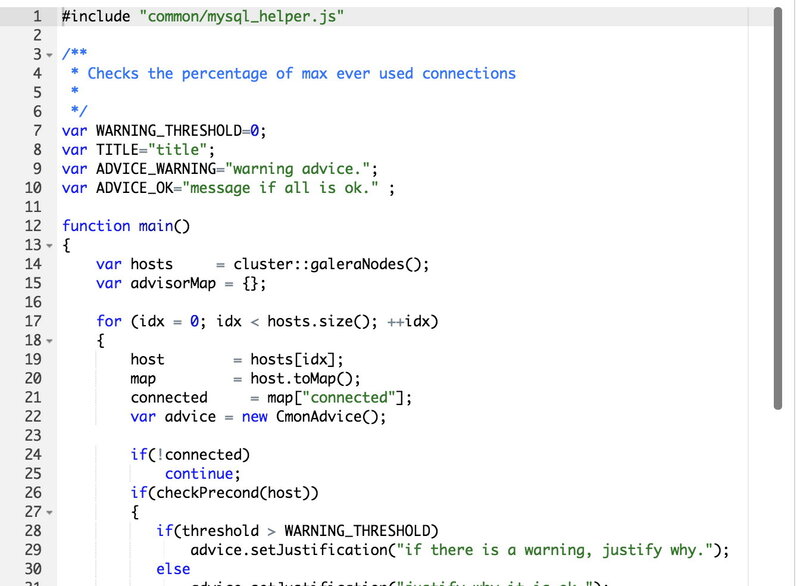 Here you can see that the mysql_helper.js gets included to provide the basis for connecting and querying MySQL nodes. The warning threshold is currently set to 0, meaning if the measured threshold is greater than the warning threshold, the advisor should warn the user. Note that the variable threshold is not set/used in the template yet as it is a kickstart for your own advisor. 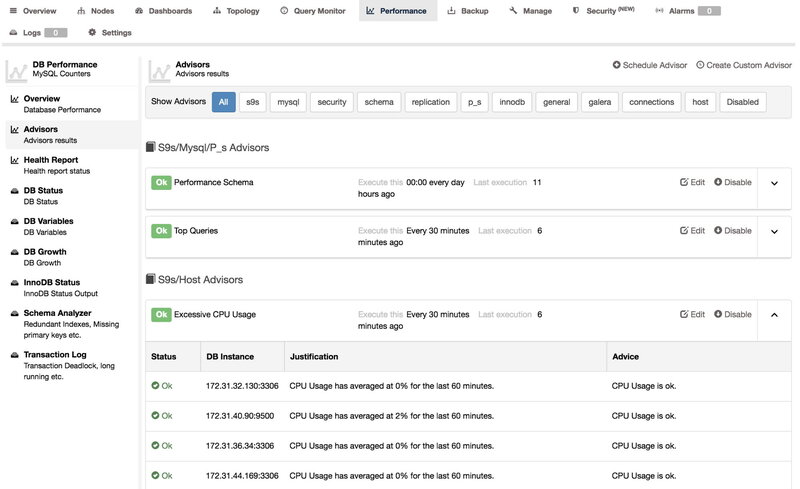 The statements above will fetch the hosts in the cluster and you can use this to loop over them. The difference between them is that the first statement includes all non-MySQL hosts (also the CMON host), the second all MySQL hosts and the last one only the Galera hosts. So if your Galera cluster has MySQL asynchronous read slaves attached, those hosts will not be included. Other than that, these objects will all behave the same and feature the ability to read their variables, status and query against them. Save will save your latest modifications to the advisor (stored in the CMON database), Move will move the advisor to a new path and Remove will obviously remove the advisor. In this case the compiler indicates a syntax error was found on line 24. Last button is the schedule button. 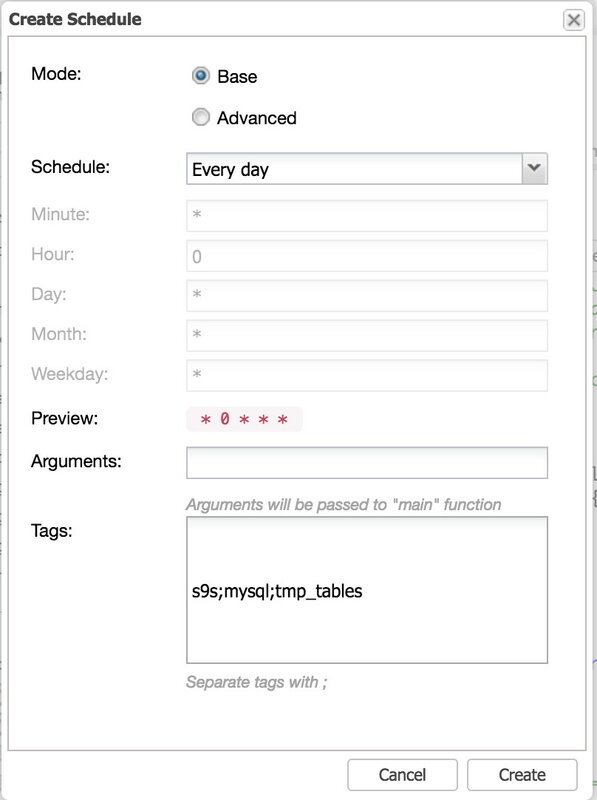 This allows you to schedule (or unschedule) your advisors and add tags to it. We will cover this at the end of this post when we have created our very own advisor and want to schedule it. We set the threshold here to 20 percent which is considered to be pretty bad already. But more on that topic once we have finalised our advisor. 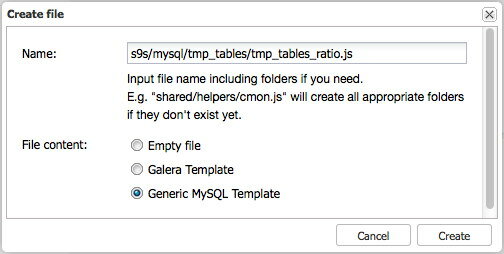 We can use this function in our advisor to fetch the Created_tmp_disk_tables and Created_tmp_tables. Now you can play around with the threshold of 20, try to lower it to 1 or 2 for instance and then you probably can see how this advisor will actually give you advice on the matter. As you can see, with a simple script you can check two variables against each other and report/advice based upon their outcome. But is that all? There are still a couple of things we can improve! This should give us the number of temporary tables per second and combined with the tmp_disk_table_ratio, this will give us a more accurate view on things. Again, once we reach the threshold of two temporary tables per second, we don’t want to immediately send out an alert/advice. Another thing we can improve is to not use the readStatusVariable(<host>, <variable>) function from the common/mysql_helper.js library. This function executes a query to the MySQL host every time we read a status variable, while CMON already retrieves most of them every second and we don’t need a real-time status anyway. It’s not like two or three queries will kill the hosts in the cluster, but if many of these advisors are run in a similar fashion, this could create heaps of extra queries. In this case we can optimize this by retrieving the status variables in a map using the host.sqlInfo() function and retrieve everything at once as a map. This function contains the most important information of the host, but it does not contain all. For instance the variable uptime that we need for the rate is not available in the host.sqlInfo() map and has to be retrieved with the readStatusVariable(<host>, <variable>) function. After we have saved this new advisor, compiled it and run, we now can schedule this advisor. Since we don’t have an excessive workload, we will probably run this advisor once per day. 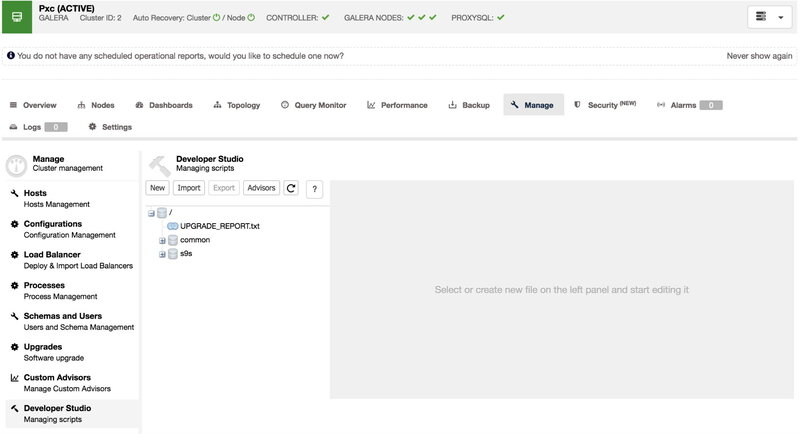 The base scheduling mode is similar to Cron which has every minute, 5 minutes, hour, day, month preset and this is exactly what we need and is very easy to manage the scheduling. Changing this to advanced will unlock the other greyed out input fields. These input fields work exactly the same as a crontab, so you can even schedule for a particular day, day of the month or even set it on weekdays. Following this blog, we will create a checker for SELinux or security checks for Spectre and Meltdown if nodes are affected. Stay tuned!